A package of rules to limit greenhouse-gas emissions from coal-burning electric plants is "one of President Obama’s most contentious domestic decisions" but has turned the U.S. from "one of the world's worst actors" on the issue to a catalyst for what could be the first global agreement to cut the emissions blamed for climate change, reports Coral Davenport of The New York Times. Davenport writes from Lima, Peru, where global negotiations about climate change are concluding: "American negotiators are being met with something wildly unfamiliar: cheers, applause, thanks and praise," because of Obama's "June announcement that he would use his executive authority to push through an aggressive set of regulations on coal-fired power plants. . . . The enthusiastic reception on climate issues comes a month after a historic announcement by the United States and China, the world’s two largest polluters, that they would jointly commit to cut their emissions." Obama's plan "set off a firestorm of legal, political and legislative opposition at home," Davenport notes. "Critics have called it a 'war on coal' that could devastate the American economy. But in the arena of international climate change negotiations, it has fundamentally transformed the feeling toward his administration." John Kerry, making the first appearance by a secretary of state at such talks, didn't mince words when talking about coal plants, saying, "We’re going to take a bunch of them out of commission." 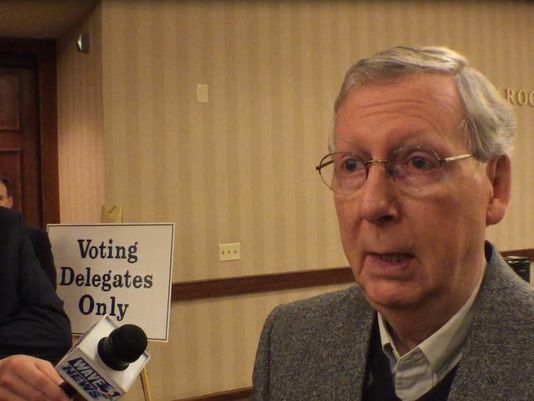 His former colleague in the Senate, Republican Leader Mitch McConnell of Kentucky, says he will attack the proposed rules through appropriations bills. "Despite the new Republican majority in the Senate, it appears unlikely that Mr. McConnell will be able to summon the votes necessary to repeal Mr. Obama’s rules—a point that American negotiators are making repeatedly here," Davenport writes. About one-third of U.S. farms are run by married couples, but many of those farms are considered to be run by men, Runyon writes. Sondra and Matt Pierce have been running a sugar beet farm in Colorado for years, with Matt working a regular 9-to-5 job in addition to farm duties, while Sondra works exclusively on the farm. Sondra told Runyon, "Technically, I don't own the farm. I mean, I just work on it. Most of the things we sell are always in his name." It wasn't until 2002 that USDA "began collecting information—like gender and age—from more people on a family farm, not just from the person in charge," Runyon writes. 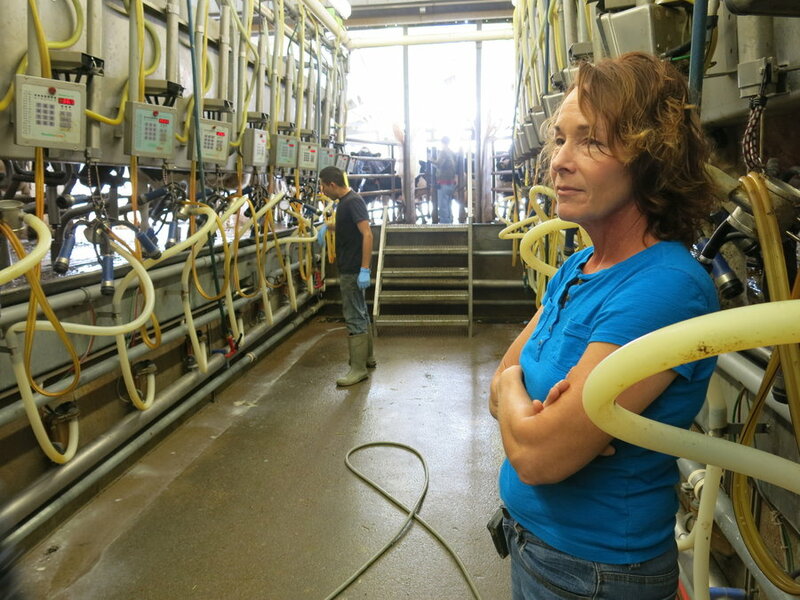 "That's led to a broader picture of who does the farming in the U.S. Still, there are limits, and sociologists say expectations about what constitutes women's work on the farm can be slow to change." "In 2002 about 27 percent of farmers were women," Runyon writes. "In 2012 that increased to more than 30 percent. The share of U.S. farms primarily operated by women has steadily increased over the past three decades, from 5 percent in 1978 to nearly 14 percent by 2012." The Federal Communications Commission agreed on Thursday to boost spending by 60 percent to $3.9 billion to bring high-speed Internet access to schools and libraries in poor or rural areas, reports The Washington Post. The move would probably increase phone bills by about $2 per year. "I was going with a goal to discover something bigger than myself," writes Tess Hart, who along with Mary Kaleta headed northeast out of Columbia. "We had no big destination. Today we were going small—to the little towns that dotted the map. I glanced at the big paper map spread out across Mary’s lap, and Mexico, Mo., jumped off the page. I turned north and let the weight of my right foot press a little harder on the pedal." 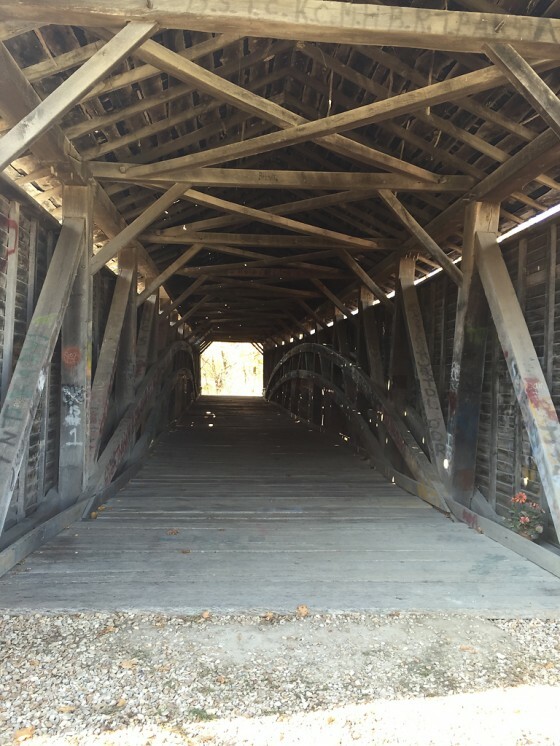 Niki Kottman and Jenna Fear traveled to the southeast, where they ended up in New Florence, a town with a population of 750, and where "entertainment comes in the form of looking out windows and hoping for something new to happen," Fear writes. But in a small town, finding help after getting the car stuck in a ditch turned out to be no problem at all, Fear writes. "A woman stepped onto her porch. She’d been watching us through the window. She’d called the city workers to help, she said, but they were busy filling potholes. She walked us to the neighbor’s house. The neighbor called someone, and soon enough a big white truck rounded the corner and pulled up to my sad little car. He pulled us right out. We gave thanks, equally impressed and surprised by the kindness of these strangers." "A welcome party of about nine dogs ran toward us before we reached the driveway," Kohler writes. "The first few words exchanged were awkward. The inflection of her voice seemed as if she were asking, 'Why are you here?' But, channelling our inner William Least Heat-Moon, we asked about a good place to eat. From there, the conversation unfolded." "Her name was Vickie Burrows, which we didn’t find out until the end of our hour-long visit," Kohler writes. "She told us about her family. Her ancestors lived in this area and owned the farm. Her older sons helped run the land they left behind. She lives with her daughter, 16, who is in a 'complicated' stage of her life. Vickie even told us about her husband’s passing in March after his long battle with cancer and how her farm hit highs and lows during his illness. I felt as though I could have talked to Vickie all day, but we had to leave, so Alexa and I left Vickie to her chores. We continued on." Students also traveled west, southwest and north. Their instructor was Sara Shipley Hiles. 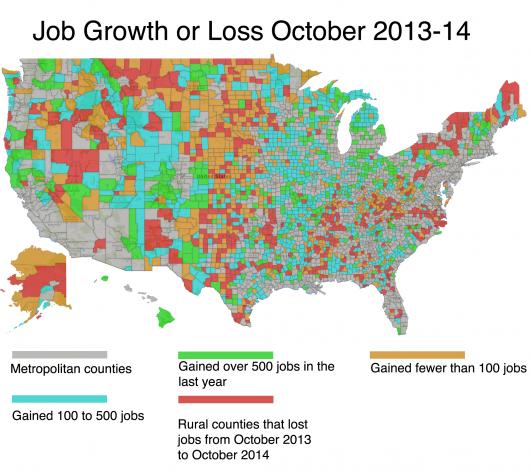 Rural America continues to add more jobs. From October 2013 to October 2014, rural areas added 428,000 jobs—a 2.1 percent increase—and a significant increase over numbers from September 2013 to September 2014 when rural areas added 208,000 jobs, according to the U.S. Bureau of Labor Statistics, Bill Bishop reports for the Daily Yonder. From October 2013 to October 2014, metro areas added 3.4 million jobs, an increase of 2.7 percent. The Kaiser Family Foundation is hosting a webinar for journalists from 12:30 to 1:30 p.m. (EDT) on Dec. 18 about how federal health reform's employer requirements affect businesses and workers. On Jan. 1, 2015, larger employers will be required to offer coverage to their workers or face penalties. The webinar will address how the penalties work, what options employers have to comply with the requirement, how provisions will affect coverage and costs for employers and workers as well as the implications of the King vs. Burwell case recently taken up by the Supreme Court. After a brief presentation by Gary Claxton and Larry Levitt, co-executive directors for the Kaiser Family Foundation's Program for the Study of Health Reform and Private Insurance, there will be a question and answer period. To register for the event, click here. People who live in rural counties adjacent to a metro core have higher rates of happiness, says a study by researchers at Penn State University published online in Social Indicators Research. "Educational attainment, employment opportunities including self-employment and social capital have important benefits in terms of community mental health," the study's authors wrote. 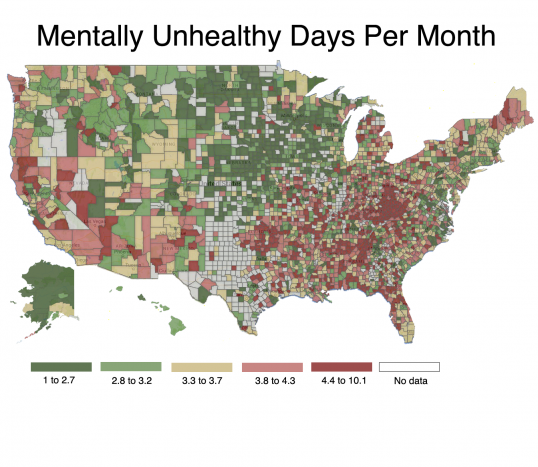 "For policymakers concerned about reducing the average number of poor mental health days across the nation, our results suggest that reducing poverty is a more powerful strategy than reducing income inequality." For the study, "researchers correlated mental health with a number of environmental factors," Tim Marema reports for the Daily Yonder. "In addition to tracking the rural and urban status of the counties, they also looked at poverty rates, income levels, weather-related data like number of days of sunshine and other climate information and whether the counties had experienced droughts or other natural disasters." Congress is passing a Fiscal Year 2015 budget that includes a 50 percent cut of $123 million "in mostly planning monies for Census 2020 in the U.S. Census Bureau’s 2015 budget," Phil Sparks, of The Census Project, wrote in a mass email. "As the seven living former Census directors, both Republican and Democrat, wrote in a recent letter to Congress, critical planning for the next decennial census cannot wait and funds must be appropriated now for money-saving techniques that could cut the costs of taking the census by billions of dollars," Sparks writes. "But, these techniques need to be tested in the field next year for implementation in 2020." Proposed cuts could lead the Census Bureau to "be forced to accept a significantly less accurate measure of America, which would carry its own high economic and governmental costs, according to advocates," Michael McAuliff writes for the Huffington Post. "The census is required by the Constitution to count everyone in the nation every 10 years, an endeavor that has gotten increasingly expensive for many reasons, including population growth, inflation, rising distrust of government and increased difficulty tracking everyone down and getting them to answer," McAuliff writes. "For the last several decennial counts, the cost has roughly doubled from one to the next. After the last one, which came in slightly cheaper than predicted at $13 billion, Congress ordered the Census Bureau to figure out how to do it cheaper." 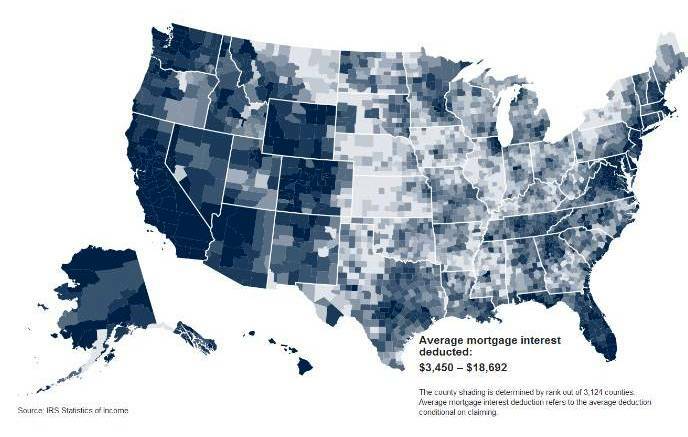 Brookings has created a county-level interactive map that looks at the mortgage interest deduction (MID) on owner-occupied homes. "The MID allows taxpayers to deduct mortgage interest on up to $1 million in debt used to purchase or refinance a primary or secondary home, as well as for up to $100,000 of home equity debt not used to buy, build or improve the home," Benjamin Harris and Lucie Parker write for Brookings. "The MID is available only to the minority of households whose combined itemized deductions—which include such items as state and local taxes paid and charitable contributions, as well as mortgage interest—exceed the standard deduction." 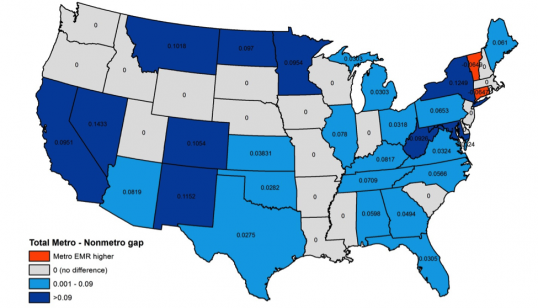 "This geographic variation leads to a large gap between low and high claiming counties," Harris and Parker write. The bottom 10 counties have taxpayer claim rates of 7.3 percent or lower, while the top 10 have claim rates of 28.3 percent or higher. Adding in itemized deductions and the bottom 10 have mortgage interest deductions of $5,241 or lower, while the top 10 have deductions of $9,433 or greater. The oil and gas industry can be a profitable—and dangerous—one in which to work. While the Bakken Shale boom in North Dakota has led to an increase in jobs and a flourishing economy, oil and gas extraction worker fatality rates are seven times greater than the rate for all industries. Between 2003-2010, 823 workers were killed, according to the U.S. Department of Labor. Left behind are grieving families—some of whom are fighting to collect death benefits from companies who them. One such case is Brandon Belk, who two days before his death in 2013 was cleaning a frack tank for Badlands Power Fuels, Mike Soraghan reports for EnergyWire. Federal worker safety inspectors found the working conditions dangerous, and "his autopsy says he died from pneumonia—fluid in the lungs—which points to the chemical exposure" of a mix of solvents and petroleum gunk. But Belk also had traces of of methadone—a potent and often abused painkiller—in his bloodstream, Soraghan writes. The autopsy report "indicates he wouldn't have died without the methadone and citalopram, an antidepressant for which he had a prescription. And his death certificate states he had no 'injury at work.'" "To his former employer, that settles it," Soraghan writes. 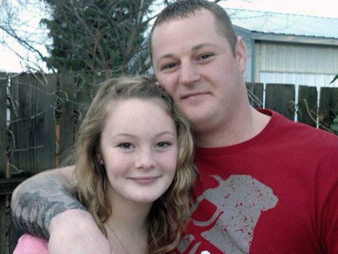 "So, too, for the Occupational Safety and Health Administration (OSHA) and the North Dakota workers' compensation system, which has denied death benefits to his 13-year-old daughter." Liz Merritt, an executive of Nuverra Environmental Solutions, Power Fuels' parent company, wrote, "The North Dakota Forensic Medical Examiner's Office report concluded the death was an accident unrelated to the workplace. We can provide no further details or information regarding this incident." "North Dakota Forensic Examiner William Massello said sometimes he just doesn't know whether a death is job-related. When that happens, procedures dictate that he just check 'no,'" Soraghan writes. Massello told him, "Sometimes, we might not be sure whether it's work-related or drug-related—or a combination of both—so we have to check off 'no.' Sometimes the person has an accident, and they go home, and they take drugs—too many drugs. And the issue is, what role did the accident play in this? It isn't clear." What also isn't clear is whether proper safety precautions were taken, Soraghan writes. "The employees who had cleaned the tanks were inexperienced. No one tested the air in the tanks before they got in. Some didn't wear eye protection and protective clothing in the confined space. None of them wore a respirator." "During OSHA's investigation, Nuverra acknowledged a mistake, according to the case file, which EnergyWire obtained under the Freedom of Information Act," Soraghan writes. "'Low-level managers had sought out new chemicals that could clean out frack tanks faster, but they didn't have a procedure for making sure they were safe." One of the most vocal opponents of the "War on Coal" has been profiting the most from the industry's decline, Tim Loh reports for Bloomberg. While the industry's marketing capitalization has shrunk from $78 billion in 2011 to about $25 billion today, Robert Murray, chief executive officer of Murray Energy, has catapulted his Ohio-based company into the country's fifth-largest coal producer, while making Murray Energy the largest privately held coal producer in the U.S.
Last year Murray Energy doubled in size by spending $3.5 billion to acquire five of Consol Energy's West Virginia operators. In September, Murray—who owns 12 active underground coal mines in Ohio, Illinois, Kentucky, Utah and West Virginia—told industry members to expect more coal producers to go bankrupt. In a 1988 interview, Murray referred to President George H.W. 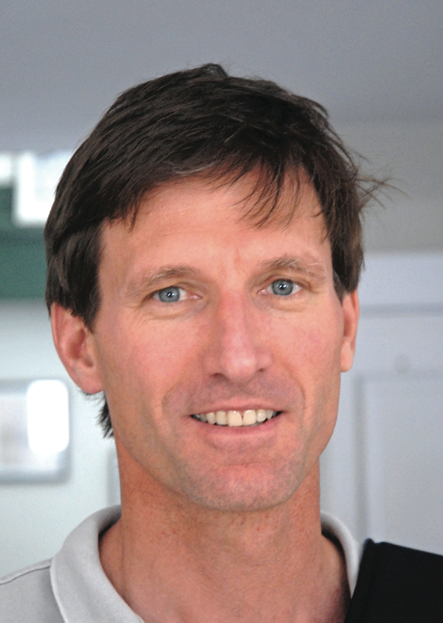 Bush and the Clean Air Act and "blasted proposals to toughen U.S. emission standards as 'criminal fraud' being perpetrated by a 'terrible government and a terrible president,'' Loh writes. "All the while Murray was devising a strategy to capitalize off of it. He recognized early that power plants had a choice to make: either install expensive 'scrubbers' to reduce sulfur-dioxide and other emissions to comply with the law or start buying low-sulfur coal from as far away as Wyoming." Murray "identified which plants were likeliest to install scrubbers then went about buying as much of the coal reserves those retrofitted plants would require as he could," Loh writes. "He told plant owners he'd be able to sell them coal so cheap they'd wind up coming out ahead, even after they invested in the scrubber technology." Murray hasn't looked back since, Loh writes. This year he said he expects to mine 64 million tons of coal, worth about $3.6 billion, up from a revenue of $1.3 billion in 2012. Kentucky has refused to give a planned amusement park more than $18 million in state tourism tax credits because the business has hiring practices that discriminate based on religion, Linda Blackford reports for the Lexington Herald-Leader. 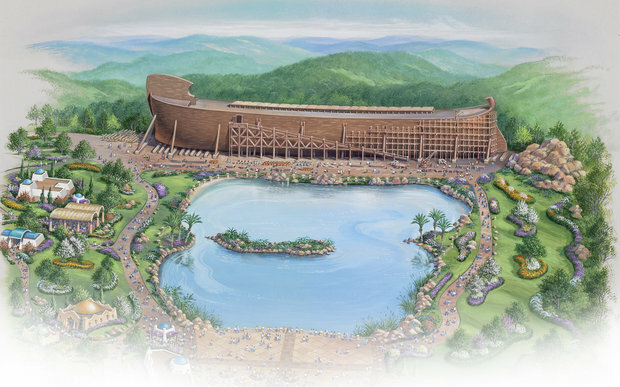 In a letter to state officials, James Parsons, attorney for Answers in Genesis, wrote, "Merely allowing Ark Encounter LLC to participate equally in the neutral tax incentive program of Kentucky and to exercise all its rights allowed under existing state and federal law cannot be construed in any way as a diversion of state funds to further any religious mission or endorse any religious viewpoint of Ark Encounter." But Tourism, Arts and Heritage Cabinet Secretary Bob Stewart disagreed, writing that "state tourism tax incentives cannot be used to fund religious indoctrination or otherwise be used to advance religion. The use of state incentives in this way violates the separation of church and state provisions of the constitution and is therefore impermissible," Blackford writes. Rural medical practices are adopting electronic medical records at a higher rate than urban ones, according to a study by Oklahoma State University researcher Brian Whitacre published in the Journal of the American Medical Informatics Association. The study, which uses data from 2012, says that 56 percent of rural practices have switched to medical records, compared to only 49 percent of urban ones, Whitacre reports for the Daily Yonder. A 2007 study said 18 percent of rural practices had electronic records, compared to 24 percent in urban ones. "As part of the American Recovery and Reinvestment Act of 2009, the HITECH Act specifically focused on increasing the adoption of EMRs by offering Medicare and Medicaid incentive payments to physicians who 'meaningfully used' EMRs," Whitacre writes. More than $30 billion was available in funding, which translates to between $44,000 and $64,000 per eligible practitioner made over a period of six years. "In addition to these payments, the act set up a federally funded Regional Extension Center (REC) program with personnel dedicated to assisting primary care providers to adopt and use EMRs," Whitacre writes. On Tuesday night House Republicans filed a $1.1 trillion year-end spending bill that blocks the Environmental Protection Agency from applying proposed water rules to certain farm ponds and irrigation ditches—a move that Grand Old Party aides said would benefit farmers, Ed O'Keefe reports for The Washington Post. Speaker John Boehner (R-Ohio) said the House is pushing for a floor vote as early as Thursday. But both sides were forced to concede certain aspects of the Clean Water Act, reports David Rogers for Politico. "Democrats blocked some of the biggest ticket items impacting greenhouse gases. But even as the bill was filed, a legal dispute remained over how much the EPA and Army Corps of Engineers will be limited in a major rule-making that seeks to define what navigable waters come under federal control." As part of the bill "environmental regulations on some waterways were nullified for the Army Corps of Engineers, but the Environmental Protection Agency would not be limited in its ability to regulate new bodies of water under the Clean Water Act," Ashley Parker and Jonathan Weisman report for The New York Times. Farm groups have said "the rule would essentially require farmers to begin meeting USDA standards for a range of conservation measures, including grass waterways and forage management," reports Agri-Pulse, a Washington newsletter. 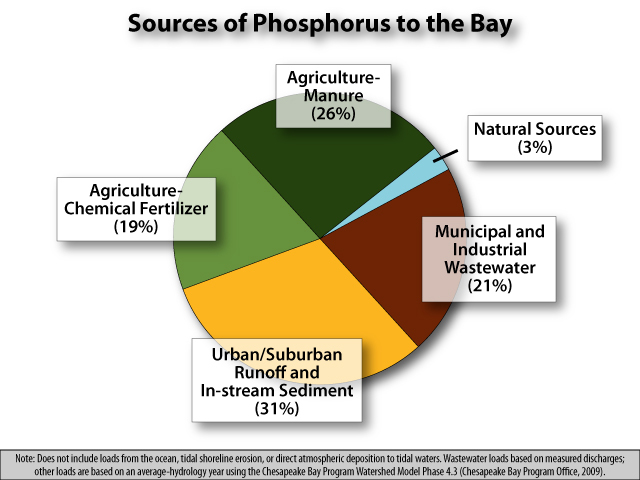 "The interpretive rule was issued in conjunction with a proposed rule defining what areas are regulated as 'waters of the United States,' or WOTUS," reports Agri-Pulse. "The two measures set off a firestorm among farm groups alarmed at the impact they would have on land use. Killing the interpretive rule is the 'first step in killing the massive regulatory overreach' of the WOTUS rule, said Don Parrish of the American Farm Bureau Federation." Agri-Pulse is subscription only, but a free trial is available by clicking here. The $1.1 trillion year-end spending bill that House Republicans filed Tuesday night includes several provisions related to agriculture. Among the 1,600-pages of the bill are "an abundance of policy riders—backed by trucking, mining and securities interests—shows the [Grand Old Party’s] new clout," David Rogers reports for Politico. "But the giant measure also reflects a genuine give-and-take with Senate Democrats in hopes of averting a government shutdown veto fight with President Barack Obama." Speaker John Boehner (R-Ohio) said the House is pushing for a floor vote as early as Thursday. Legislation orders Agriculture Secretary Tom Vilsack "not to implement a new beef checkoff program, a move the secretary made because of an industry impasse over making changes to the existing program," reports Agri-Pulse, a Washington newsletter. 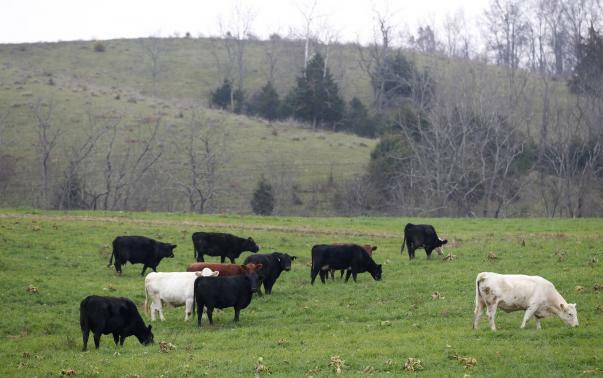 The National Cattlemen’s Beef Association applauded the provision. Spokesman Chase Adams told Agri-Pulse, “We appreciate Congress' support of the beef checkoff program in siding with America's cattlemen and women, against the Administration's duplicate checkoff." The program "is a producer-funded marketing and research program designed to increase domestic and/or international demand for beef," says Cattleman's Beef Promotion and Research Board. "This can be done through promotion, research and new product development, and a variety of other marketing tools. The Cattlemen's Beef Board and USDA oversee the collection and spending of checkoff funds." Lawmakers will likely have to pass a new continuing resolution to keep the government in operation while the spending agreement moves through the House and Senate this week," reports Agri-Pulse. "The continuing resolution that’s now funding the government expires Thursday." Agri-Pulse is subscription only, but a free trial is available by clicking here. The Department of Agriculture’s Grain Inspection, Packers and Stockyards Administration would continue to be prohibited from implementing new regulations on the livestock and poultry industry. Recipients of benefits under the Women, Infants and Children nutrition program would be allowed to use their benefits to buy white potatoes. The ban on the slaughter of horses would continue in effect because of a prohibition, included in the bill, on USDA inspection of horse processing. The Department of Interior would be barred from listing the sage grouse under the Endangered Species Act. The Secretary is asked to ensure that the revised federal dietary guidelines due next year don’t incorporate environmental factors into the recommendations, a move that could discourage meat and dairy consumption. Researchers at Princeton University say that 19 abandoned wells in Pennsylvania are emitting high levels of methane, Richard Valdmanis reports for Reuters. The study, which was conducted in 2013-14 and published this week in the Proceedings of the National Academy of Sciences, says that wells were emitting an average of 0.27 kg (0.6 lbs) of methane per day. The study's authors wrote: "These measurements show that methane emissions from abandoned oil and gas wells can be significant. The research required to quantify these emissions nationally should be undertaken so they can be accurately described and included in greenhouse gas emissions inventories." Researchers "estimate that abandoned wells in Pennsylvania could account for 4-7 percent of all human-sourced methane emissions in the state," Doyle Rice reports for USA Today. "The researchers say the wells in Pennsylvania could be representative of all the wells across the country." A University of Texas study published this week in the journal Environmental Science & Technology—and supported by several natural gas companies and the Environmental Defense Fund—"found that leaks at a small group of wells—about 20 percent—cause most of the known methane emissions," Rice writes. To serve whole-grains or to not serve whole-grains. House Republicans filed a $1.1 trillion year-end spending bill Tuesday night "that includes a provision that would allow schools to get around a whole-grains requirement in school meals if it’s too expensive or schools are having trouble finding alternatives," reports Agri-Pulse, a Washington newsletter. "The provision stops short of the broad waiver from nutrition standards that was included in the House Appropriations Committee’s fiscal 2015 legislation." Rep. Robert Aderholt (R-Ala.), the chair of the House Appropriations Agriculture Subcommittee, "said the whole-grains waiver was the most that Republicans could do for now," Agri-Pulse writes. "Next year, when the [Grand Old Party] controls the Senate, they could expand the waiver for fiscal 2016 and possibly roll back the standards through reauthorization of the Healthy, Hunger-Free Kids Act. Aderholt said, “Come Jan. 6 when the new Senate gets sworn in then it is a new day." Agri-Pulse is subscription only, but a free trial is available by clicking here. Speaker John Boehner (R-Ohio) said the House is pushing for a floor vote as early as Thursday, David Rogers reports for Politico. "In the case of nutrition and school lunch standards promoted by first lady Michelle Obama—a clear flash point—the House retreated to compromises crafted by Senate Democrats. School districts are promised more flexibility in meeting requirements for some items such as whole grain products. But this is far less than the broad waiver that had been promoted in the House." 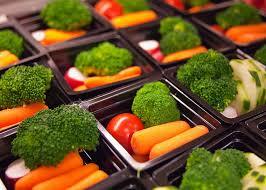 The School Nutrition Association has joined several major food companies to oppose the rules. Some students have refused to eat the healthier foods and have gone to social media to post photos of what they say are unappetizing meals. After a recent tour of schools U.S. Department of Agriculture deputy under secretary for food Janey Thornton said school lunches are too short to eat healthy meals. The Senate passed a bill Monday to strengthen the federal Freedom of Information Act, and it awaits approval in the House, which unanimously passed a similar bill in February. "One of the most important changes included in the act is codifying the 'presumption of disclosure' that was announced by President Obama and Attorney General Holder in 2009," Adam Marshall writes for the Reporters Committee for Freedom of the Press. "Including this presumption in the law itself will help ensure that FOIA requests from reporters and members of the public are not hindered by policy changes in subsequent administrations. Under the new standard, and agency may only withhold information if it 'reasonably foresees that disclosure would harm an interest protected by an exemption' or another provision of law." The bill, which passed by unanimous consent, was in danger because of a hold placed on it by retiring Sen. Jay Rockefeller (D-W.Va.), apparently at the behest of the Federal Trade Commission. He lifted his hold on the bill late Monday, allowing the bill to proceed, Marshall reports: "When asked about the reasons for his delay, the senator rather mysteriously said, 'It’s sort of the internal workings of the Senate.'" About one-third of all prescription drug abusers travel out of state to shop for a doctor, says a study funded by the National Institutes of Health published in Pharmacoepidemiology and Drug Safety. This is because "many states have drug monitoring programs in place to track prescriptions dispensed within their borders—but not across them," Jason Millman reports for The Washington Post. Douglas McDonald of Abt Associates, who co-authored the study, told Millman, "Part of the problem is that state systems all vary—they're either home-grown or operated by different vendors, and they're not interoperable." 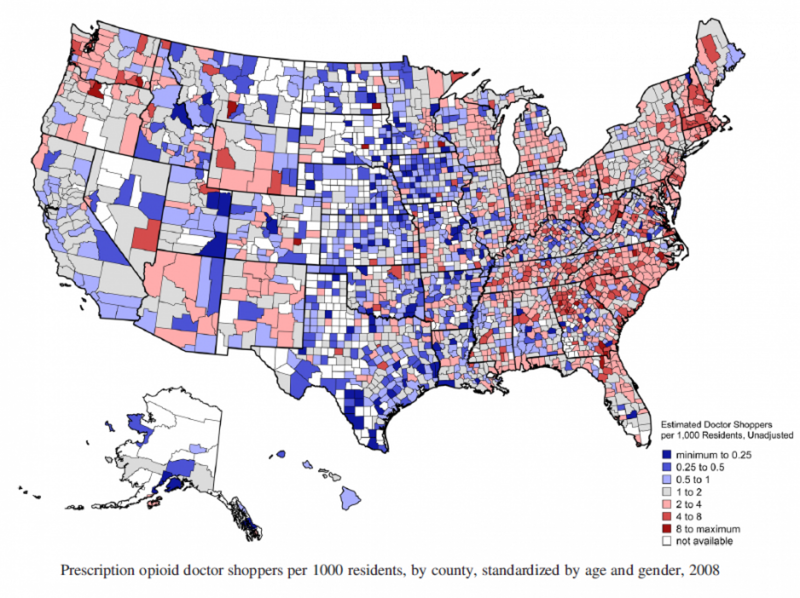 As a result, smaller states like Rhode Island, New Hampshire and Delaware are having some of the highest rates of occurrences, with drug shoppers making the trek from neighboring states to buy prescription drugs. 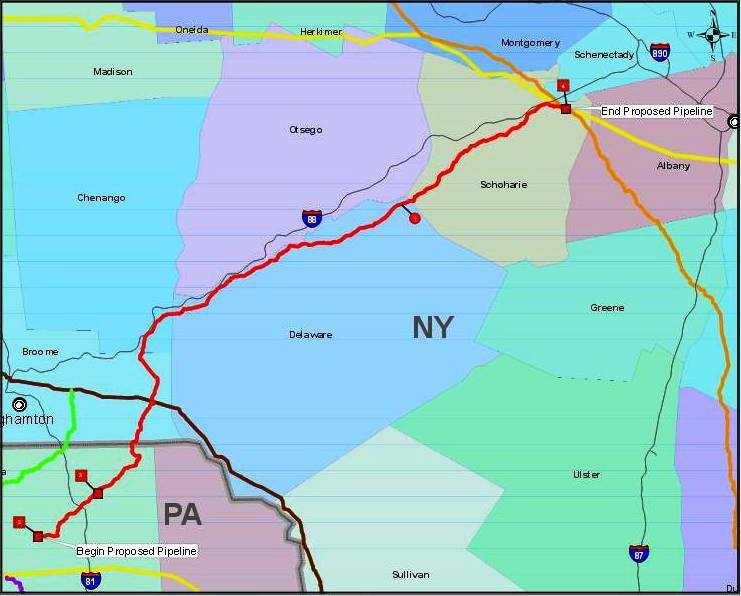 Landowners who refused to grant easements on the 124-mile route of the recently federally approved Constitution Pipeline from Pennsylvania to New York are being told they have until Wednesday to accept offered prices, or they will be taken to court, where they may be forced to sell for lower prices, Brian Nearing reports for the Albany Times Union. On Dec. 2, "the Federal Energy Regulatory Commission gave the project a conditional approval, finding it was a public necessity and authorizing Constitution to invoke eminent domain—the ability to buy access rights from unwilling property owners," Nearing writes. "The approval was conditional on the project receiving several permits from the state." An antibiotic widely used—and misused—on cows poses a greater threat to human health than previously thought, Michael Erman and Brian Grow report for Reuters. The U.S. Food and Drug Administration cautioned in 2012 that ceftiofur—the key component in the top-selling drug line of manufacturer Zoetis—could pose a "high public health risk, in part because the drug belongs to a class of antibiotics considered critically important in human medicine. The concern is that ceftiofur in animals could spawn antibiotic-resistant bacteria, superbugs that can infect people and defeat conventional medical treatment, even when the drug is used as directed." "The ceftiofur residues are not themselves considered dangerous to people if ingested because the government sets its standards well below hazardous levels," Erman and Grow write. "But the traces serve as a warning sign that the drug was used shortly before the animal was killed, thus increasing the chances that the meat contains superbugs, said Guy Loneragan, a veterinary epidemiologist at Texas Tech University. Studies show that ceftiofur, more than most other drugs, can sharply increase the amount of antibiotic-resistant bacteria in an animal." Loneragan told Reuters that it eliminates weaker bugs and leaves the stronger ones to survive and multiply. But officials at Zoetis counter that ceftiofur is safe to use as directed. "The stakes are especially high because the drug is part of a crucial class of antibiotics called cephalosporins," Erman and Grow write. "The class includes ceftriaxone, a drug that’s vital to treating pneumonia, meningitis and salmonella infections in children, according to the FDA. The use of one type of cephalosporin can compromise the effectiveness of others in the same class." Conservationists and the oil and gas industry are at odds over the status of the Gunnison sage grouse. Last month the U.S. Fish and Wildlife Service listed the grouse as "threatened," a move that upset conservationists, who believe the birds should be listed as "endangered," Erik Molvar reports for The Hill. Rick Bailey, who runs an oil and gas lease brokerage in Nevada, said he has had hundreds of thousands of acres of potential leases put on hold, AP writes. He told AP, “We’re not real happy about it. It’s not even an endangered species." 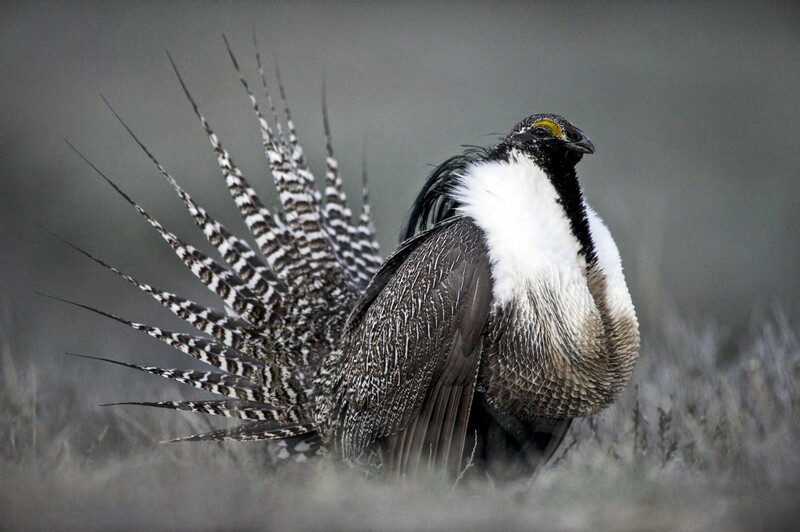 But conservationists have likened the sage grouse to "the Northern spotted owl, another imperiled bird that stirred a fight over logging in the Pacific Northwest," AP reports. As part of the Farm Bill, eight states will participate in a pilot program to increase purchases of locally grown fruits and vegetables for school meals, reports Agri-Pulse, a Washington newsletter. The states participating in the Pilot Project for Procurement of Unprocessed Fruits and Vegetables are California, Connecticut, Michigan, New York, Oregon, Virginia, Washington and Wisconsin. About 20 percent of food served in schools comes from a list of 180 U.S. Department of Agriculture foods that schools choose from, but the pilot program will allow states "to purchase unprocessed fruits and vegetables directly, instead of going through the USDA Foods program," Agri-Pulse writes. Newly-elected Republican Maryland Gov. Larry Hogan said his first order of business when he takes over office in January is to fight new farm pollution regulations intended to limit runoff in the Chesapeake Bay, Timothy B. Wheeler reports for The Baltimore Sun. 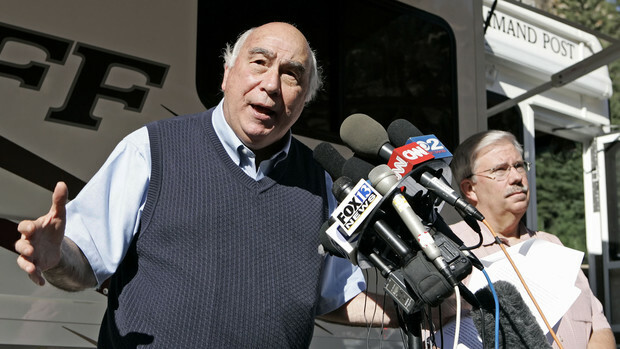 Hogan told supporters, "The first fight will be against these politically motivated, midnight-hour phosphorus management tool regulations that the outgoing administration is trying to force upon you in these closing days.We won't allow them to put you out of business, destroy your way of life or decimate your entire industry." Republicans in Congress are not giving up on their quest to let schools temporarily opt out of healthier lunches. A stalled one-year waiver by House Republicans "that would allow schools to opt out of the standards if they lost money on meal programs over a six-month period" is gaining new life "as lawmakers are expected to pass a catchall spending bill to keep government programs running," reports The Associated Press. The waiver was written by Republican Rep. Robert Aderholt of Alabama, a state where 18.6 percent of all children ages 10 to 17 are obese, and 32.4 percent of adults are obese. Sen. John Hoeven (R-N.D.) said "there are ongoing negotiations between the House and the Senate over the waiver," AP reports. "A Senate bill approved by a spending committee in May did not include the waiver but called for further study on sodium and whole grains requirements. At the time, Hoeven said there was not enough support for the House's one-year waiver in the Senate, even though he was supportive of it himself. But he said this week that could change as lawmakers negotiate the massive year-end spending bill." House Minority Leader Nancy Pelosi (D-Calif.) "said 'lowering standards for school lunches for our children' is one of a few 'very destructive riders' that would be unacceptable to Democrats in the spending bill," AP reports. First Lady Michelle Obama, who has pushed for healthier meals, said this summer that she would "fight 'until the bitter end' to make sure kids have good nutrition in schools." McConnell said while speaking at the Kentucky Farm Bureau Federation's annual meeting that the proposed rules will particularly hurt the agriculture and coal mining industries, Gerth writes. "The American Farm Bureau opposes the rule, saying that it could potentially be used to block farmers from building fences across ditches and applying fertilizer or pesticides without a federal permit." McConnell stressed that he will work to continue passing appropriations bills and avoid a government shutdown by concentrating on three areas: tax reform, infrastructure funding and trade agreement, Kevin Wheatley reports for cn|2, a service of Time Warner Cable. "The only time McConnell applauded the president during his State of the Union address came when Obama said the country needs to pursue trade agreements," Wheatley reports. McConnell "said he’s willing to give the administration trade promotion authority, 'an enormous grant of power' to Obama and 'something I’m not routinely inclined to do, as you can imagine.' That would give the president the ability to present trade agreements that would be voted on by Congress without amendments." School lunch nutrition has become a national debate, as First Lady Michelle Obama's push to get kids to eat healthier has been met with stiff opposition. The House proposed then delayed voting on a bill to let schools losing money on their lunch programs opt out. The School Nutrition Association joined several major food companies to oppose the rules. Some students have refused to eat the healthier foods and have gone to social media to post photos of what they say are unappetizing meals. Thornton told Goode, “The more we’ve looked into the concerns, it’s been really interesting to see that the concerns have not necessarily been related to the meal pattern itself but some of the challenges in implementation. Because there has been an emphasis more on fresh . . . it just takes longer to eat fresh fruits and vegetables than it does processed." Thornton "said the issue with time varies across the nation, but many of the schools she has visited that have found the lunch period to be too short are in the process of addressing the issue and expanding eating time," Goode writes. "A lot of resistance from students comes from the fact that they have not experienced certain foods before because they are not offered to them at home, she said." Thornton told Goode, “It is amazing how many kids have never had cauliflower or broccoli, much less Brussels sprouts or kale.” The Standard is behind a paywall but can be viewed by clicking here. The Intelligent Community Forum, a non-profit aimed at improving digital access in municipalities, has partnered with the Mississippi State University Extension Service to create a global institute to help revive the state's rural communities through technology, CivSource reports. A similar program is located at Walsh University in North Canton, Ohio. Biddle Duke, a well-respected weekly newspaper owner and publisher in Vermont, is stepping down after 17 years of being at the helm of the Stowe Reporter LLC, which consists of two Vermont weeklies—The Stowe Reporter and The Waterbury Record—two magazines and three mobile-optimized websites, Paul Heintz reports for Seven Days, a weekly newspaper in Vermont. Duke, whose last day is Dec. 18, will remain on as a minority shareholder, and Greg Popa will take over as publisher of both newspapers. While the company will be purchased by out-of-state investors Bob Miller and Norb Garrett, Miller said no changes are expected regarding how the publications operate, Heintz writes. UPDATE, Dec. 11: Miller does a Q and A about his ownership. Duke told Heintz, "I was looking for not only a financial exit but also the right thing because I think newspapers need to continue to thrive. Bob and I and Norb have spent the last 14 or 15 months feeling each other out. We've become great friends. They're great partners, and it's been really great." "I think I'd have reservations whether it was an in-state person or an out-of-state person," Duke said. "I'm filled with all kinds of emotions at the moment. I want these institutions to carry on and thrive. That's my main ambition." "We view ourselves as a training center. Many of our best employees are graduates of local high schools and colleges, so we are very much a part of the Vermont web of career success for young people interested in journalism, graphics, sales and, now, social media. It fills me with pride to think of former reporter Scott Monroe, now an editor of a group of daily newspapers in Maine; of former reporter Jesse Roman, a roving reporter for a national magazine based in Boston; of former editor Matt Kanner, now launching his own alternative newspaper in Portsmouth, N.H.
"But changing lives—or at least having a positive impact of some kind—is what it’s all about . . . The hardest thing about being a newspaper publisher or editor—and I’ve done both those jobs, in addition to salesperson, photographer and reporter—is that you can’t be friends with everyone. I seem to have pissed everyone off at one time or another, and it’s my experience that you just have to be OK with that. "I’m a publisher who goes out of his way to face the music. I vowed to be that way when I set out with this, so now whether it’s a comment overheard, an email or a phone message, I have done my utmost to urge people to complain and criticize in the broad daylight: to me, in person. "Whether that’s stood me well, I don’t know. In some cases, it has been like running out into traffic, but in most cases I have been able to explain why we do what we do the way we do it. Often my explanations are not enough. And in some cases, I have lost friends or made enemies of people I might have befriended. That’s a newspaper publisher’s cross to bear, at least one with any kind of ethical spine. "One of my goals was also to eventually grow the business and sell it. But don’t ever believe all those people who say business isn’t personal. That might be true for some businesses, but not this one. Some part of me feels, “How could I leave this cherished community institution?” As if I am abandoning a responsibility and privilege that I myself created. But that’s arrogant and narcissistic. The Reporter company carries on, with or without me. But I will miss the work and my Reporter family very much." Government organizations in Michigan could soon no longer be required to post public notices in newspapers, reports the Michigan Press Association. The House passed HB5560 by a 62-47 margin on Thursday. The bill would over a 10-year period "phase-out requirements that public notices be published in print newspapers that cover the jurisdictions of local governments" and "phase-in requirements that the notices be published online." Supporters say the move will cut costs—eliminating thousands of dollars spent each year publishing in newspapers—while also reaching a wider audience online, MPA writes. Opponents argue that newspapers are a more effective way to inform the public, and the bill would allow local governments to have more control over their advertisements and "remove the independence that newspapers bring to the process," MPA writes. A recently released interactive county-level map shows exactly who benefits from the earned income tax credit, which was created in 1975 to reduce the federal tax burden on low-income families. EITC is more likely to benefit rural families than urban or suburban ones, says a report from the Center for Rural Affairs. While many low-income families rely on the money, President Obama and the GOP-led Congress are in a battle over its future of the program, with Obama favoring an extension of the program. Of the top 10 counties that rely on EITC seven are in Mississippi, two in South Dakota and one in Texas. 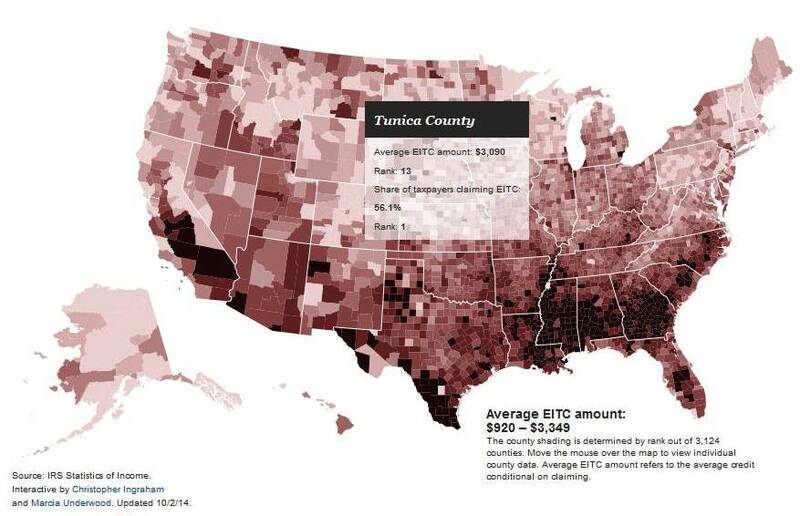 In rural areas, Mississippi has the highest rates of federal tax returns claiming EITC, at 37.5 percent, reports Tim Marema for the Daily Yonder. "For over a century, life in Central Appalachia has been largely defined by the ups and downs of the coal industry. Through all the bust years, there was always the promise of another boom. Until now," Allen G. Breed of The Associated Press reports from Cumberland, Ky. "There is a growing sense in these mountains that this downturn is different, deeper. That for a variety of reasons — economic, environmental, political — coal mining will not rebound this time." "There’s no hope for our children in the future here," Madonna Sizemore says, tears filling her eyes. "And I hate that." Some families are staying at a cost. 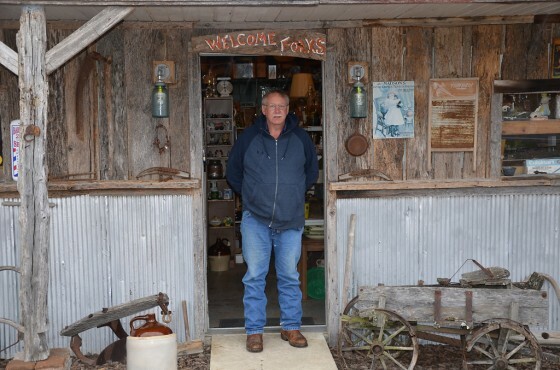 Madonna Sizemore's husband, Scottie, is driving 340 miles one way to work in an undeground coal mine in Western Kentucky, where the coal is less expensive to mine and still competitive. Breed, who worked in Central Appalachia early in his career, sets the scene at the Sizemore home as the man of the house prepares to leave: "It’s midmorning, but the sun has yet to crest the ridge above, where mist clings like clouds that couldn’t quite make it over." Breed's 2,770-word story, accompanied by an 18-photo gallery, is a comprehensive look at the challenges facing the region. "No one is saying that mining will cease altogether here — at least not anytime soon," he writes. "But when you’ve been so dependent for so long, there are bound to be withdrawal pains — and denial."